Traditional BI solutions face many obstacles and limitations. However, the need for timely and succinct business intelligence (BI) continues to grow. As a result, BI has continued to evolve - creating a next generation of BI. 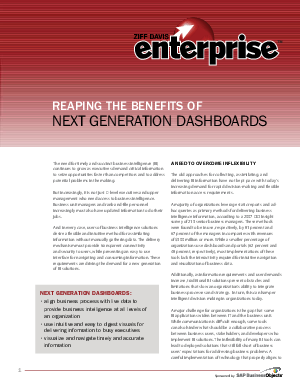 This white paper explores how organizations are demanding more integrated and flexible business intelligence solutions that facilitate more timely and informed decisions, as well as how next generation of dashboards solve these challenges.